The Naughton Project was a fun and exciting family project. The client was looking for additional seasonal living space closely connected to the kitchen and greater living space so that meals and the outdoors, including the spectacular view could be enjoyed earlier in the spring and later in the fall. We started by reviewing the space requirements and the function of the space, we looked at access requirements, doors and how the client envisioned the space being used. Once we collected that information we got to work designing the space and figuring out the structural and decorative requirements. After ordering the components to be assembled onsite, we developed a project plan and booked a 3 week period to start and complete the project. This project included a new, second story deck with patio below, staircase, railing system and Sunspace Sunroom with weather master vinyl window system to maximize ventilation and outdoor exposure as necessary. 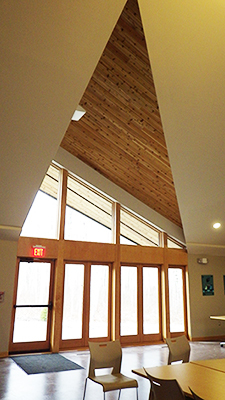 On of the most interesting components of the project was sourcing a beautiful one of a kind decorative cedar beam that really brings the natural elements of the outdoors in. That was a great idea and we had fun solving how to deliver. It’s great clients with great ideas that make our work so rewarding! 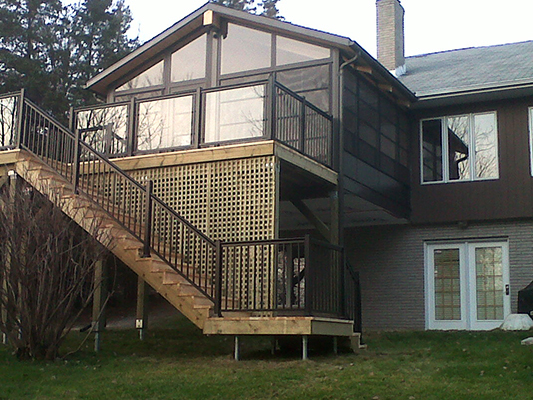 Enjoy the Sunspace sun room, your friends at Windows Unlimited in Greater Sudbury.